Looking to add the best wood pellet grill to your backyard? We’ll share the research we went through before deciding on the one that works best for us. When we bought our house, one of the best features was the large backyard and the potential to create a great backyard escape. Our first project was to build a deck. Right after finishing the deck, I immediately started to research grills. I’ve lived in Florida my entire life and was used to bbq which mostly consisted of shredded pork, ribs and a sweet BBQ sauce. My wife is from Texas and I vividly remember one of the first times we went to a local BBQ restaurant and she lamented how horrible it was. I never questioned how good or not good the local BBQ was until that moment. One year later and I was on my way to Austin to meet her family. We went to a local BBQ joint, I don’t even remember the name, and was floored by how flavorful the meat tasted. I never had smoked brisket until that fateful day and it was the most delicious piece of meat I ever tasted. I know it sounds ridiculous, but unless you ever had true Texas style smoked brisket, you can’t describe the flavor that overwhelms your taste buds. That along with the smoked sausage was truly life changing because as soon as I came back to Florida, I couldn’t stomach the local BBQ any longer. I was obsessed with learning how to properly smoke a brisket. However, because of the mystique of smoking brisket, I was intimidated. Then life got hectic, so it got put on the back burner. I was ready to find the best grill that I could also use for smoking. I was finally ready to tackle my first brisket. What I found out was that there are smokers and then there are grills, but very few choices for a combination. I went to the local Lowes and noticed there was a combo grill by Oklahoma Joe. It had a propane gas grill along with a charcoal grill and an offset smoker box. This sucker was huge and though I had hesitations about how big it was for a family of two, I had pretty much settled on the fact I would be purchasing it very soon. Then, one fateful Sunday, I turned on the TV and started flipping through channels. I stopped as soon as I saw a woman standing in front a funny looking grill. Turns out, I was watching a Traegar infomercial and the first time I ever heard about a pellet grill. Who the hell is going to use a grill for baking?? I was transfixed watching this infomercial for at least an hour. The things they were saying about this grill sounded too good to be true. Set it and forget it temperature capability, smoking without constant fear of the fire getting too hot or too cold? I had to learn more. Side note, my attention span is pretty low so anytime I’m technically watching TV, I also am on my laptop researching or perusing any and every subject. So while I’m watching this infomercial, I started Googling pellet grills. I’ve listed, in my option a table that shows all pertinent info for each grill so you can choose the features that are important to you. Being able to leave and still keep an “eye” on the grill via WIFI is great. The hopper holds a lot of pellets. Like I said before, the Traegar infommercial is what got me started in looking for a pellet grill. This seems to tick all the boxes when we first started looking. It’s interesting that once you really start researching it that the differences stand out. Our best friend got the Camp Chef outdoor oven for her RV, so we added this product to our list since she loves her oven. No WIFI capability and we really wanted it. This setup seems to have a little of it all. You get grill cover, grill pad, along with pellets, and thermometer for the price. It has great temperature precision and goes up in increments of 5 degrees. This is great if you need consistency. With 340 square inches for cooking, you can smoke a turkey or brisket easily. Assembly is more difficult than it should be and the legs aren’t too stable. Over 700 square inches, you’re going to be able to smoke a lot of food at one setting. The legs are sturdy and allows you to easily move the grill anywhere you need to cook properly. Porcelain cast iron main grids for cooking surface and has the ability for open flame cooking. Can have a hard time keeping low temperatures for low smoking ability. A pellet grills seems like a mythical creature. The ability to set a temperature on a grill and know that you don’t have to continuously babysit it is a game changer in grilling/smoking. I’m not sure if pellet grills will ever take the place of regular grills just for the price point. You can still walk in your nearest Walmart and get a small charcoal grill for under $50. 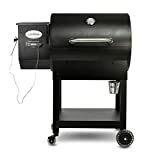 The lowest price for a decent pellet grill is over $500 and you can’t find them as readily as charcoal or gas grills. 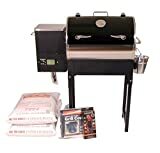 Pellet grills are similar to gas grills in that you can start the grill quickly but the beauty is that it has the flavor of a charcoal grill. The biggest con about pellet grills other than the higher price is lack of searing capability. Since pellet grills have indirect heat, it is hard to flame broil a burger or steak. The Camp Chef grill has addressed this issue by some models having an optional side searing burner. I don’t mind the lack of sear capability because I like the flavor from smoking at lower temperatures. I learned pretty quickly that there are many different models and they have been around since 1988. Traegar has been around since 1988 since they are the ones that invented the pellet grill. The pellet grill was invented using the same process as a pellet stove though using different pellets. Traegar patented the process for pellet grills which is why there was no competition until the patent expired in 2006. In 2008 there were still a very small amount of pellet grill manufacturers but by 2014 there were over 27 according to Wikipedia. The beauty of marketplace competition is constantly making a product better with new features and usually better pricing. I started looking at grill prices and saw that the Traegar advertised on the infomercial was between $500 to $800. Comparing that to the Oklahoma Joe which was $429, I knew that I wanted to research more about the different brands since it was going to be a big investment. 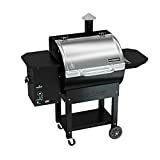 I limited my search to pellet grills under $1000 and on the smaller size, since I mostly cook just for two. At that price range, it ruled out Memphis Grills but from what I hear very worth it if money is no object. Also, Yoder, Fast Eddy and Mak1 which all retail above $1000 and also very excellent grills. So my choices included the Traegar, Louisiana Grills, Camp Chef, Green Mountain Grills, and the Rec Tec pellet grill. Traegar grills website does a great job describing exactly how a pellet grill functions since they invented the pellet grill. A pellet grill essentially uses an auger to feed pellets from the pellet box to the grill box where they are burned. An electric controller controls the pellet movement as well as a fan that comes on intermittently that helps keep the temperature constant. Some of the older pellet grills could only control temperature with a 50-75 degree difference. Today’s grills are within 5 degrees. Most all pellet grills are composed of a digital controller, heavy metal construction and a convection fan that circulates air in cooking chamber. 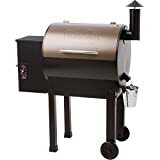 All the grills above have these features with some variance in thickness of metal, if it’s powder coated or stainless steel, grilling area size and what type of digital controller. 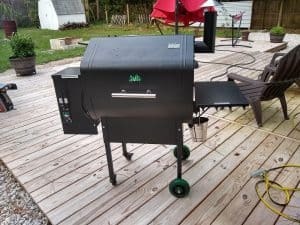 Originally I thought we’d get the smaller Green Mountain Grill Davy Crockett since the price point for the features couldn’t be beat by any other pellet grill. Then we had the opportunity to see the grill at a local patio store that specializes in outdoor living including patio sets, awnings, and outdoor kitchen setups. As I went into the outdoor kitchen section, I spotted the Green Mountain Grill Davy Crockett. I started asking the salesperson all about it, and their opinion of it (they also had several other types of grills). She stated that her husband owned the larger version as well as a Green Egg, and once he got the Green Mountain Grill, he used it exclusively for all his grilling. I then noticed that they had the two larger version GMG grills the Daniel Boone and Jim Bowie. At that point, she got her husband to answer the rest of my questions. I was skeptical about the wifi capability on the grill but he stated he used it all the time. He would turn on the grill while he was driving home from work so it would be up to heat by the time he got home. He also stated that at times he would have to go to the grocery store to pick something up while smoking and loved that he could check everything while away. He talked about the fact that, as a owner of a Patio store, that had many different types of grills, he was impressed with GMG’s customer service. Feeling more confident that I had found my grill I spoke with my wife about which one she liked. We ended up with the Daniel Boone with WIFI because it looked like it would fit our needs best. Many of the grills have a grill cover you can add, but if you need a better one, we researched grill covers that you can check out.